Water Boards Water Pipework Responsibility:Water mains pipe in the roadThe stop tap in the road or pavement; and usuallyThe supply pipe from the water main to the boundary of your property.The water meter, where fitted. They have a legal responsibility to maintain and repair any of these pipes. 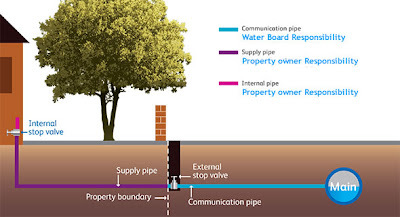 Property owner's Water Pipework Responsibility:The supply pipe from the outside boundary to your property. Your own stop tap, either located in your garden or inside your house.All the plumbing inside the property, for example, all pipework, water tanks, taps and overflows.If your pipe runs under other properties before it reaches yours, it is still your responsibility. Any issues with your internal plumbing, or any leaks in your front garden or under your drive are likely to be your responsibility to repair. The property owner has a legal duty to repair leaks on their private pipes under Section 73 of the Water Industry Act 1991.
the cost of tracing a water leak Contact your Insurance company to see if you are covered for ' Trace and Access ' as this may cover for the cost of a leak detection survey. An insurer will pay for the damage caused by the leak e.g. carpets and decorations, but often WILL NOT pay for the cost of tracing the cause which could include pulling up floors or breaking through expensive tiles. Potentially a significant extra cost. Trace and Access Insurance covers the cost of tracing a water leak whether it's under a wooden floor or behind the tiling in the bathroom. With a 99% success rate of finding water leaks, you can be confident that Leak Detection Specialists will find your water leak. We have engineers all over the country enabling us to provide a fast response in finding your leak in your home or business. Our technical engineers have many years of knowledge in plumbing, heating and leak detection. Our senior engineers have trained other people in the industry and provide a unique training programme for all our engineers. Our leak detection engineers are equipped with the latest modern technology to accurately locate your leak fast. Leak detection is a non-destructive solution that accurately finds a leak limiting expensive excavation well as subsequent repair and redecoration work. Although Leak Detection Specialists Ltd are a UK based company, we also offer International Leak Detection Services and have managed projects abroad to include our most recent one in The Falkland Islands. International Leak Detection is a specialised industry requiring experienced and highly trained engineers equipped with the latest leak detection technology to locate the leak. Having a leak can be a financial burden on your business and cause unforeseen damage to your commercial site and business. Our International Leak DetectionService can take away the stress by finding your leak enabling your business to recover quickly and move forward. We can provide International Leak Detection Services in all types of International commercial businesses. Our senior engineers have been working within leak detection for over 20 years gaining knowledge and experience throughout the industry. Spring is official here and with the clocks going forward we can now enjoy lighter evenings and hopefully some sun! Our engineers have been keeping busy at Leak Detection Specialists Ltd locating water leaks in both domestic and commercial properties throughout the UK. March was a busy month for finding commercial water leaks; our engineers successfully found water leaks at Array Fruit Farm in Worcestershire, on a polypipe district heating mains at Portland Prison in Dorset, at Copthall Stadium in North London , Curry's Superstore in Luton, a water leak on 10 inch cast iron pipe under ground at Mount Pleasant in the Falklands and many more commercial properties. Our skilled leak detection engineers successfully found water leaks using specialised leak detection equipment that enables them to perform various methods of leak detection. They are able to locate water leaks underground and behind walls with little or no damage to your property.